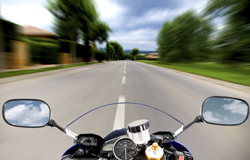 Unfortunately, motorcycle accidents are on the rise nationally and in Florida. The Centers for Disease Control and Prevention, found that between 2001 and 2008 in the US, more than 34,000 motorcyclists were killed and an estimated 1,222,000 persons were treated for a non-fatal motorcycle accident. Most of the motorcycle accidents that occur in Florida involve Floridians, not tourists. They occur for a variety of reasons: lack of visual recognition—motorcycles make smaller visual targets, road hazards—potholes, debris, puddles, uneven pavement, riding skills, and familiarity operating a motorcycle. Further, unlike a car, a motorcycle has no roof, no airbags, and no safety belts to protect the motorcycle driver and passenger, and they are much more lightweight. Being involved in a motorcycle accident can be a very stressful and scary time for all of the parties involved including family members and loved ones. If you were involved in a motorcycle accident, it is important that you don’t undertake any action to jeopardize your case. Do not admit fault for the accident to anyone no matter the circumstance. Your interpretation of the event may be skewed, so it is best not to say anything until your mind has been cleared. Seek medical attention even if you do not feel any symptoms immediately! Take pictures. Take pictures of the accident, scene, and injuries you sustained. It is especially important to take photos of bruises, cuts and scrapes you sustained because they heal quickly. Take notes regarding your medical treatment and have the contact information of chiropractors, physical therapist, or medical profession you have been visiting. This information will be necessary to receive reimbursement from your insurance company. Schedule a free consultation with an experienced motorcycle accident attorney. An experienced motorcycle accident attorney will make sure that you legal rights are protected, how to properly deal with all of the parties involved (insurance companies, witness), and may negotiate a settlement or file a lawsuit on your behalf. In 2011, the median hospital charge for motorcyclists admitted to a Florida hospital for the treatment of traffic crash injuries was $56,966. In 2011, the median hospital charge for motorcyclists treated and released from a Florida emergency department for the treatment of traffic crash injuries was $3,585. If you or someone you know has been involved in a motorcycle crash, contact experienced motorcycle accident attorneys at Williams, Ristoff & Proper. We have a lot of experience handling motorcycle crash cases and have been very successful getting out clients the compensation they desperately need and are entitled to. Call now for free initial consultation. We work on a contingent fee basis, which means there are no fees or costs unless we win.